Major extended family arrival today – three adults and two small children – so I’ll keep this brief. I say this like the busy person I was just three months ago. I’m not busy at all these days, but I’ve still managed to run out of time to get things ready. What things? That’s part of my problem: what things, exactly? I have a great sense of urgency combined with very little focus. Anyway, Easter’s history, along with the ghastliness brought on by my last chemotherapy session. Now it’s the eve of Anzac Day and I’m out of the drama of feeling utterly horrible and back into daily life in the trenches of cancer treatment. I can metaphorically (and literally, I suppose) play cards and learn French, as the off-duty Anzacs did between calls to go Over The Top. Actually I won’t learn French. Ever. Serious illness has relieved me of a whole lot of shoulds (learn French, read Ulysses). But I will crochet, because it’s really helping. Here’s a pic of work-in-progress on a representation of my guts. Not to scale or colour, obviously. The bit I’m most proud of is the small intestine. Most beginner-anatomy representations of the small intestine don’t bother to show the mesentery, the curling structure that attaches the intestines to the back of the abdominal cavity and feeds them arterial blood (see pic of mesentery of autopsied cat). 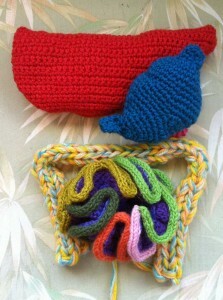 I’ve discovered that the mesentery is best represented by hyperbolic crochet, the same technique used to represent the Great Barrier Reef in the Crochet Coral Reef project. From small attachment points, the mesentery fans out, ruffles and folds back on itself, allowing the small intestines to do the same. Hyperbolic crochet is mesmerising and very relaxing. I’m scheduled to go Over The Top again on May 13. This is when I’ll be opened up from sternum to pubic bone while two or three (upper GIT*, gynae-oncol and possibly colo-rectal) specialists work on extracting my two tumours. As I crochet my threatened guts I’m learning so much about them – what they are, where they are placed, what they do. I’ll be making two tumours, too. Not sure about the colours or how to make them look horrible enough. This entry was posted in BRCA1, Craft and tagged crochet, ovarian cancer, primary peritoneal cancer on April 24, 2014 by Tracy. gosh. that time has fled so frighteningly quickly. and so terribly slowly. am sitting peacefully out the back in the last of the sun, in the company of two rabbits, a hare and a murmuring duck who keeps falling asleep – yet my guts briefly tumbled with ‘going over the top’. powerful analogy for the momentous revelation once the trenches are left. colour of cancer? hmm. first thought was a mix of pale babyshit tan shot through with fluro orange and pale wan green. i can feel cool evening starting to breathe on my thonged feet. the hare has tried to pounce mimi, who is slowly lurching down the compost heap. bit by bit she’s getting less wobbly (from a low base admittedly, but by gum she’s doing amazingly). the duck just barked at the hare who woke her sniffing her tail feathers. all lemony white. pongo nudging my leg for a pat. time to take the menagerie inside and go hunting and gathering, to feed the troops. ” All that is gold does not glitter, not all those who wander are lost. The old that is young does not wither, deep roots are not reached by the frost. From the ashes a fire shall be woken, a light from the shadows shall spring. Renewed will be they that are broken. The crown-less again shall be King.” Apologies to JRR. So, May 13 eh? That’s five days after World Ovarian Cancer Day http://ovariancancerday.org. I hope to be able to visit you in hospital. The guts are looking great. I recommend mottled dark brown/black for the tumours. Hopefully you’ll feel so much better once the real ones are out.